This is a spectacular display fossil. 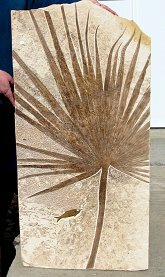 It is a very large, museum quality Palm Frond specimen from Lincoln County, Wyoming. This is a very complete Sablites sp. leaf, one of the most sought-after fossils found in the Green River Formation. The Palm has great dark color, which contrasts beautifully with the buff-colored matrix. The amazing fossil has very nice detail - the individual leaflets are even intact and well preserved! This striking specimen is also quite unusual in that there is even a fossil fish preserved on the plate. The large frond (over 3 feet long!) is wonderfully showcased on the rectangular display plate with hanging hardware attached to the back! 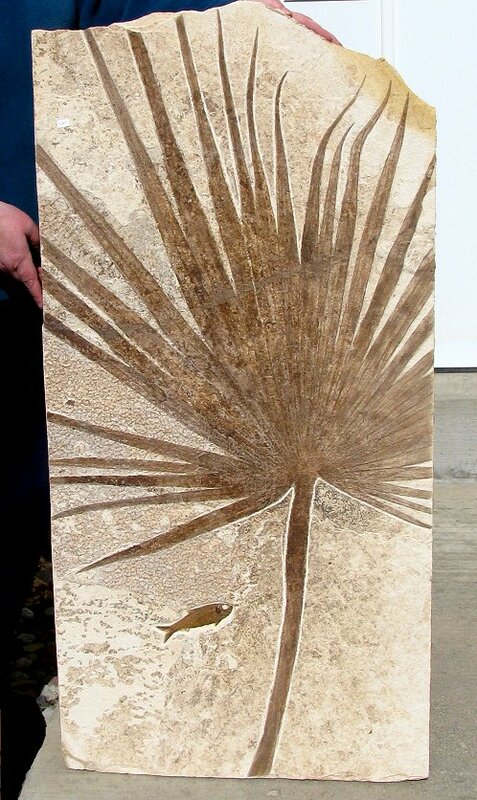 This is a fabulous, impressive example of a rare Palm Frond fossil that can not only be part of a fossil collection, but also proudly displayed in your home or office!